The Marquise Cut takes its name from a legend relating to the Marquise of Pompadour. According to the legend,the Sun King desired a stone to be polished into the shape of the mouth of the Marquise. 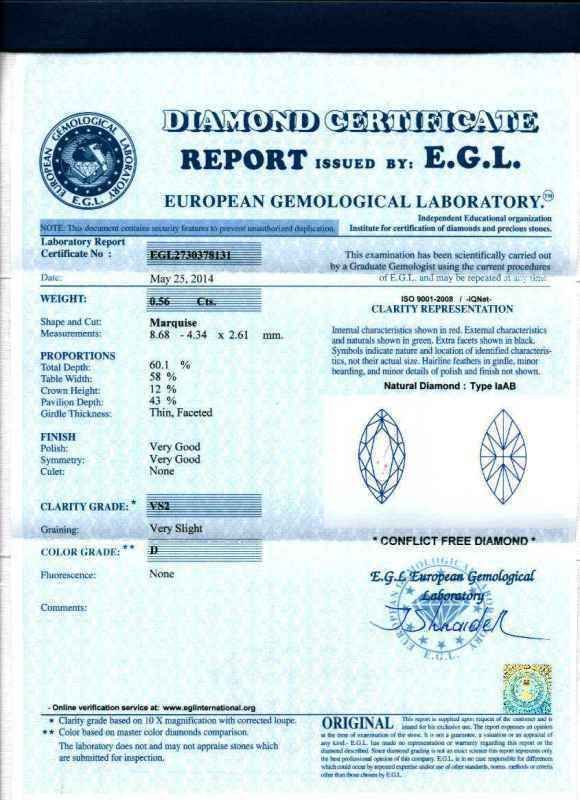 It is generally agreed that a length-to-width ratio between 1.75:1 to 2:1 is most pleasing.As with other fancy shapes,the consumer's individual taste constitutes an element of the evaluation as well.The typical marquise diamond contains 56 facets. 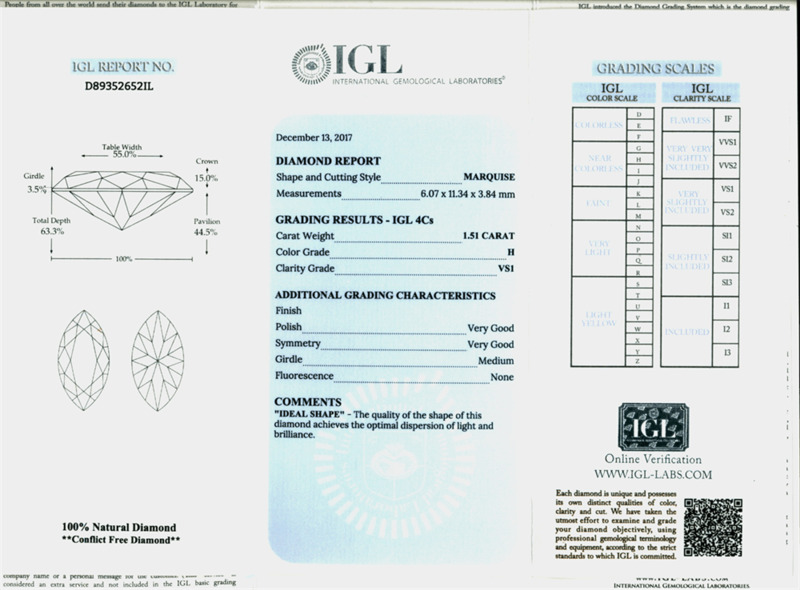 In the search below no field is mandatory, you may select the Marquise diamond budget to get results.which you may narrow the results by limiting any other field to get an eye clean and white diamond you may choose H or better color (D to H) and SI1 or better clarity (IF,VVS or VS),if you are on a budget that does not get results go down to SI2 which many are also eye clean or go down with the color to I or J. A diamond cut resembling the hull of a small boat and even the shape of an ellipse and football, is nothing but a complete head turner. Marquise cut diamond as it is known, is gorgeous from every angle. Just like the shape of an ellipse or the football, a marquise diamond features an elongated curved shape with pointed ends. If you are looking for something that will make you stand out from the crowd, you can definitely consider getting a marquise diamond for yourself. With a history that dates back to the 18th century, the marquise diamond has come a long way. Several interesting stories were associated with its origin, but the most widely followed one centers around the story of the French King Louis XV. As per this story, King Louis XV wanted to create a diamond that resembled the smile of his mistress Antoinetter Poisson, the Marquise de Pompadour and thus, on his order his court jeweler created what we today know as the marquise shaped diamond. Eventually and especially all through the 20th century, the shape was subjected to a lot of modifications. 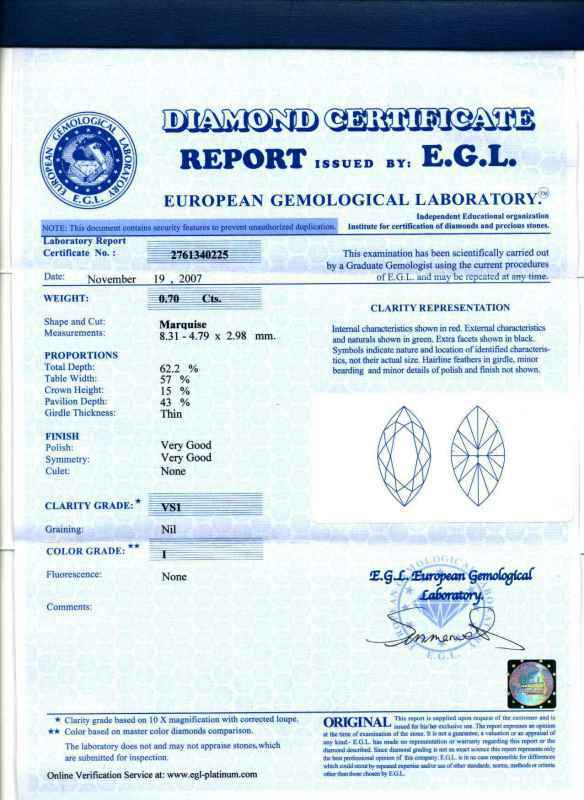 Today, thanks to the development of various diamond cutting tools, we have the very beautiful marquise brilliant cut, which stands as an embodiment of sheer beauty. Featuring a total of either 55 or 58 facets, the marquise diamond possesses 33 facets on the crown and 25 on the pavilion. The number of pavilion facets may range between 4 and 8. A marquise diamond of length to width ratio of 1.75-2.15 is deemed as the most ideal and classic marquise cut. The elongated structure of the marquise flatters the finger of the wearer. They very well complement slender and long fingers though they are also blessed with a slimming effect. They transform the look of a short and chubby finger by making them appear long and thin. The presence of a large crown surface area, coupled with the elongated shape, make the marquise cut diamond appear much larger in size than what the actual weight suggests. The shallow cut nature of the marquise is another reason behind the marquise cut appearing larger to their counterparts which features cuts with deep pavilions. 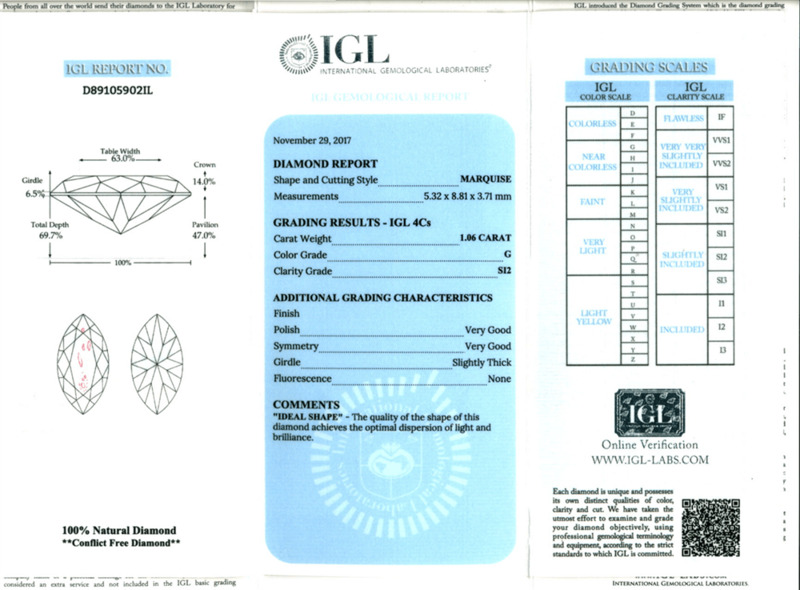 Thus, a smaller carat diamond will create an impressions of a larger carat diamond. This makes it an ideal choice for those on a tight budget. Because it possesses a great degree of fire and brilliance, a marquise cut can mask some minor flaws and color tints. The marquise cut diamond contains some amount of bow-tie effect that ranges from near invisible to severe depending on the quality of the cut. 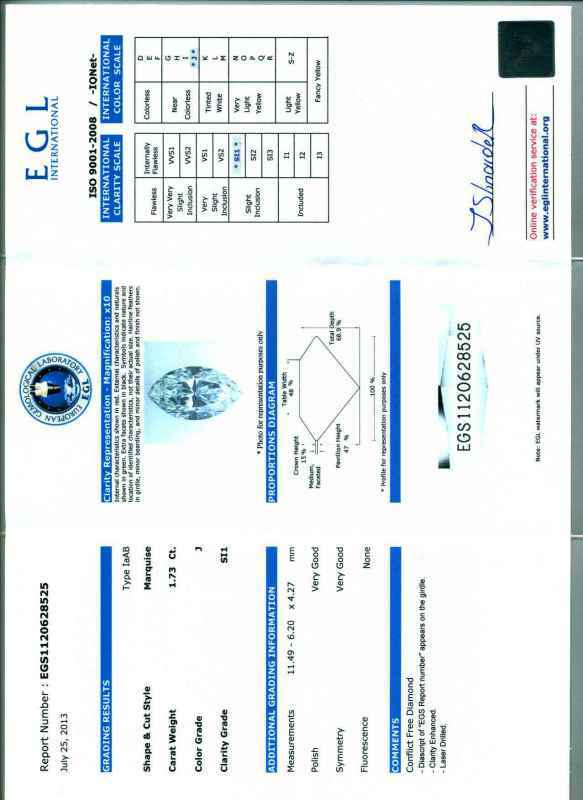 No diamond certificate can ascertain the degree of bow-tie effect. So it is only upon visual inspection that one can recognize the intensity. 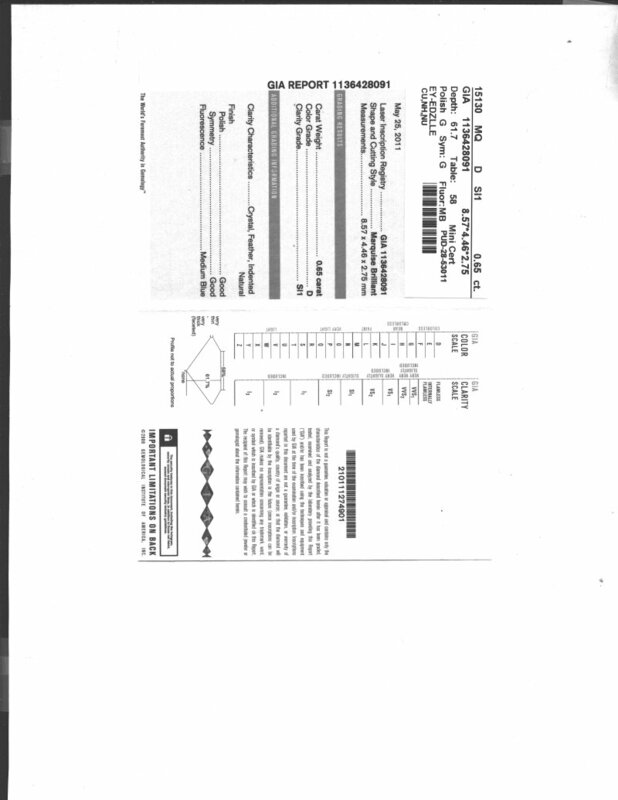 However, this bow-tie effect becomes negligible when the angles of the diamond are carefully cut. 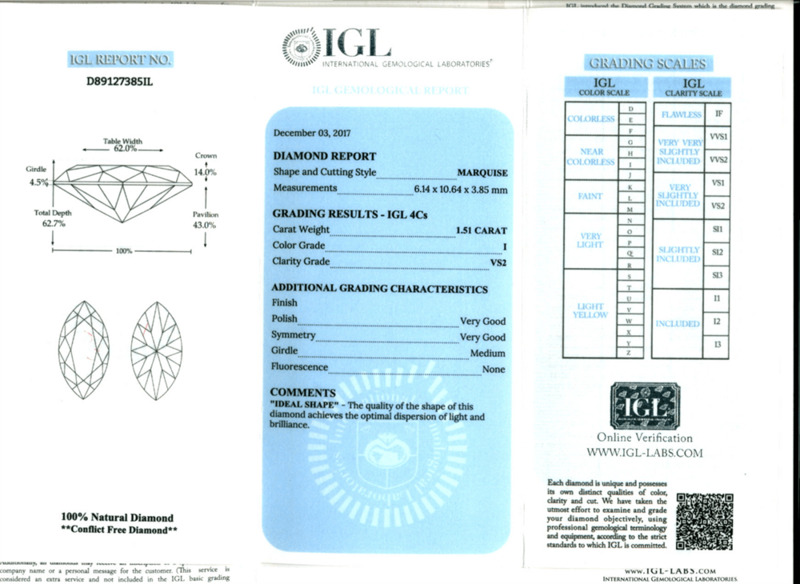 While selecting a marquise diamond, ensure that the right and left side are exactly of the same proportion. Even the two pointed ends should align with each other. A slight non-alignment will not only make the diamond look weird, but will ruin the overall look when set. 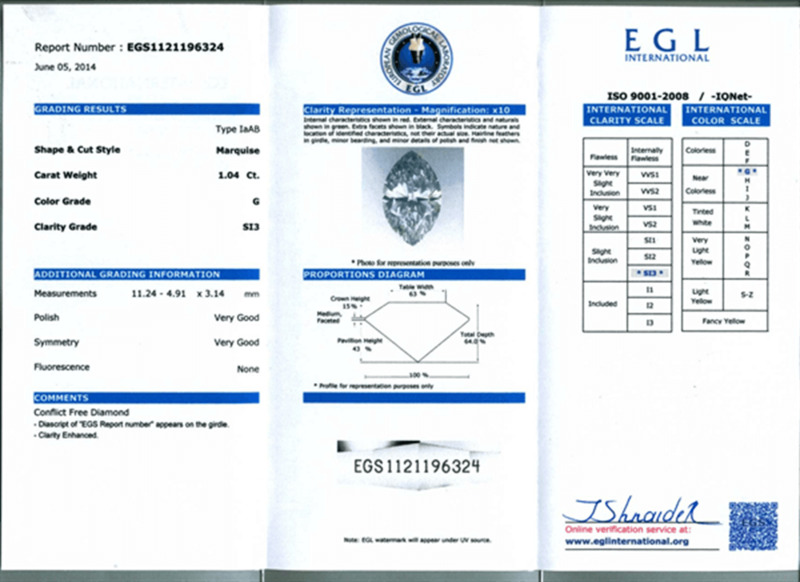 Hence, it is advisable to go for a diamond which has a very good symmetry. Another important thing to consider is that the pointed ends of the marquise diamond are home to flaws and inclusions and that makes it susceptible to chipping. Hence, make sure that they are covered with prongs as that will not just prevent it from chipping but will also hide the flaws hidden therein. In addition, opt for a marquise diamond of ideal to excellent cut as that will reduce the bow-tie effect dramatically. 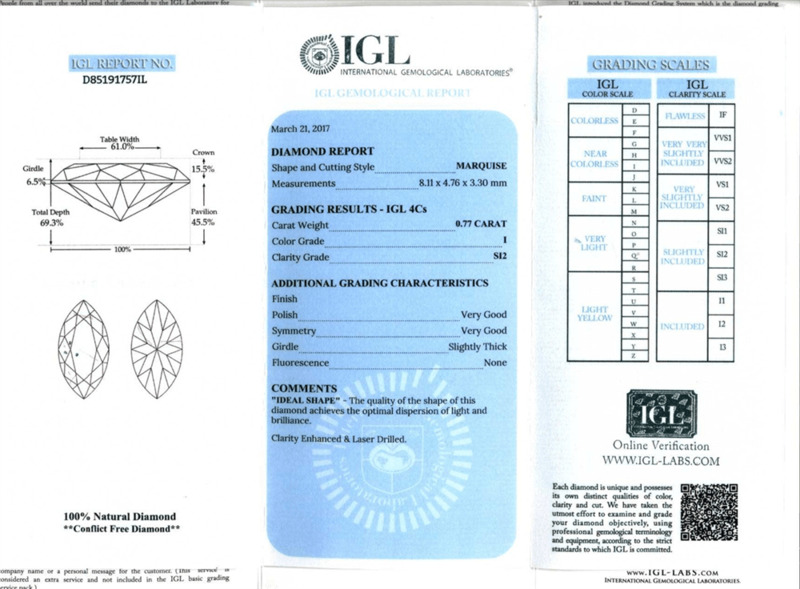 Lastly, your diamond should be certified by renowned diamond laboratories the like of which includes, GIS,AGS, EGL or IGI.